The famous breeding station Borgmann in Ostbevern in the Westphalian part of Germany offers its third private auction of selected top dressage horses of own breeding on 6 June 2015. 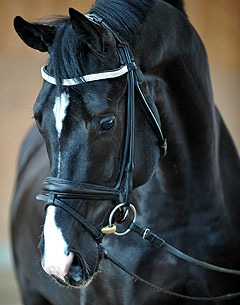 The auction includes approximately 35 home bred horses, from an embryo to 5-year old top dressage horses. The collection includes numerous remarkable horses! Amongst the 20 horses under the saddle seven are licensed stallions, including Equitaris II the full brother of the German Bundeschampion stallion of 2014 as well as Dressage Noir, a son of Dancier and another finalist of the Federal Championships of young horses in Warendorf. The farmer and breeder family of Stephan Borgmann has one great secret of success: “Everything from one source.” That means that the dam lines of the horses are family owned for more than ten generations. All horses on the auction are bred by Stephan Borgmann and his family and all horses are reared and trained by the family. Stephan's breeding programm has a proven success record! The family has bred approximately 30 dressage horse of international Grand Prix level, including Eichendorff (Victoria Max-Theurer/AUT), Fleetwood (Malin Hamilton/SWE), Falcone (Martin Christensen/DEN), Märchenprinz (Leonie Bramall/CAN), Estobar (Huberts Schmidt/GER) and Floriano (Steffen Peters/USA). Perhaps you will find your Olympic hope or your dream horse at the auction of the farm Borgmann on 6 June 2015 in Ostbevern, Germany? !